Use the Fastcall IVR to add more sophisticated call routing to groups, menus, directories and more. The Fastcall dashboard surfaces calls to groups; filtering active and missed calls. Clients often ask our advice on building their sales team. Logging, scoring and recording calls are great training tools for new and experienced teams. Every missed call is a missed opportunity! Fastcall inbound phone numbers can be used as caller ID and, of course, receive inbound calls. Calls can be received on the Fastcall softphone, routed to a user’s office phone and/or a user’s mobile phone. When Fastcall receives a call from a given number (caller ID), we will search for a match. When we find a match, we automatically relate the record to the call. Fastcall also gives an option to create a new lead. Simulring dials two phones at the same time; first to answer gets the call. 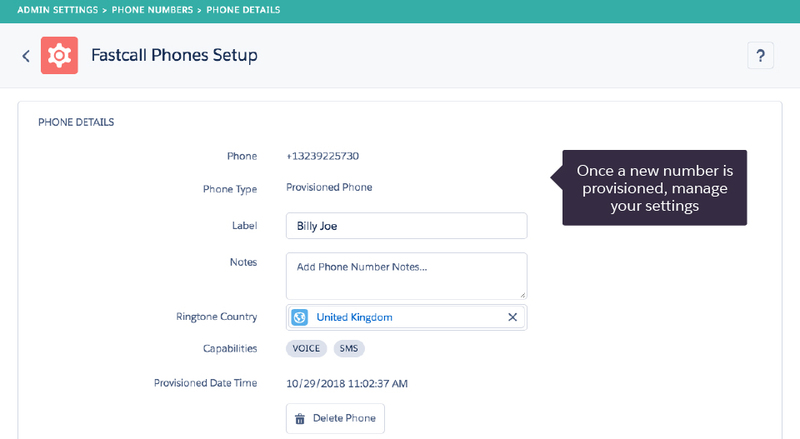 You can record calls with an optional disclosure and set up personal voicemail to be logged on the Salesforce Task record. Inbound calls pop in Salesforce. Missed calls in the widget have a search option to find a contact or create a new lead. Fastcall also marks the Task as a missed call. 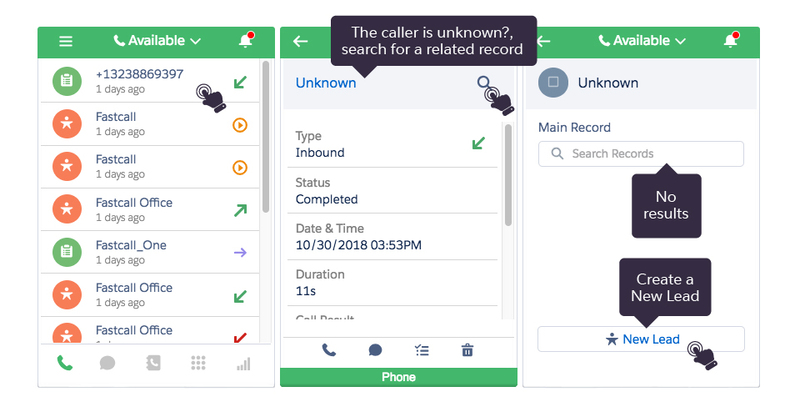 Fastcall advanced features include interactive voice response (IVR), automatic call distribution, recorded greetings, multiple numbers per user, call transfer and listen-in. Inbound calls are logged in Fastcall just like outbound calls. 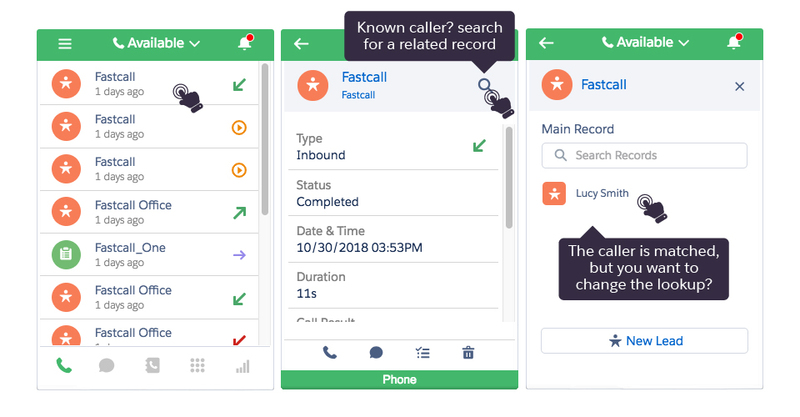 When searching inbound calls, Fastcall will try to relate the record automatically. The user can also search existing Salesforce records for a match or create a new Lead right from the Fastcall widget. Once the caller ID is matched to a Salesforce record the relationship is added to Fastcall custom lookup table. See here for more information on popping an inbound call in the softphone. Missed calls in the widget have a search option to find a contact or create a new lead. Fastcall also marks the Task as a missed call. Fastcall creates a Task for every call – answered or missed. An inbound call with no related contact is a missed call (we do not yet know who called.) In this case, the user should either lookup the related record, delete the task, or otherwise mark the task as junk. Fastcall has a custom button used to assign the call based on the caller ID (from a number.) We consider these “orphaned tasks” that need to be triaged. Keep in mind that the button must be added to the Task page layout. Creating a report of Tasks with no related records will show you calls that need to be triaged. BEST PRACTICE: You should have no orphaned Tasks related to inbound calls. 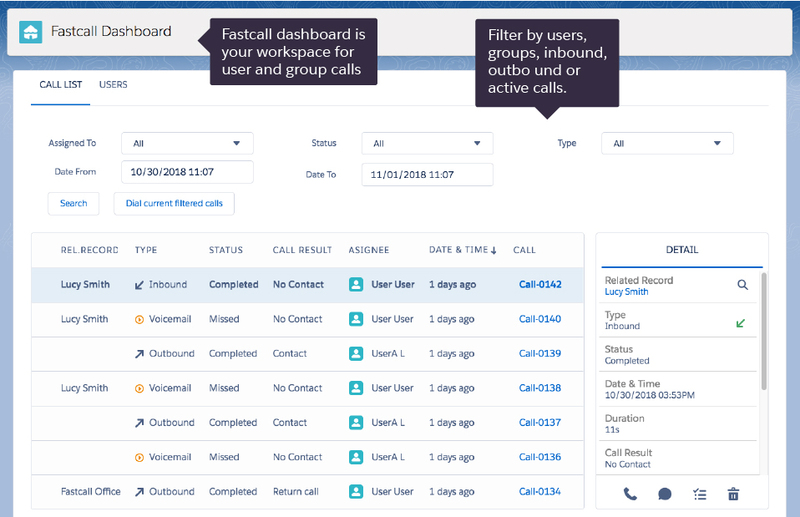 Fastcall gives four options in the recent call screen: initiate a reply call, SMS, navigate to the Salesforce Task, or delete the recent call. Cool Feature! With SMS enabled, you can message a prospect after a missed call. With SMS enabled, you can message a prospect after a missed call. In order to route inbound calls with Fastcall, your phone numbers must be controlled by Twilio. You will need to provision net new numbers with Twilio or port your existing numbers to Twilio. If adding new numbers, the phone numbers must be provisioned by Fastcall to use the number in Fastcall. If you have existing numbers in Twilio you will need to ask Twilio to move these numbers to the Fastcall subaccount. Once you use Fastcall to purchase the Twilio phone number – and this will be done inside the Fastcall app – you will be given two options to use the numbers. “User Inbound” are numbers that will be assigned to a user. Numbers assigned to a group will use the Fastcall auto call distribution (ACD.) Both types of numbers can be used as caller ID. TIP: if you plan to port a number from another carrier to Twilio you may want to verify that your current carrier will release the number. The Fastcall Dashboard is a tab found in the Fastcall application, not a settings page in the app. You will see calls filtered by date and users as well as call goals. You inspect the call history for users or groups, in-progress calls as well as missed calls. See your results updated based on the filters you select. By default, Fastcall will create a native Salesforce Task for each inbound call. We give the option to create an open Task for a missed call, and/or a voicemail. 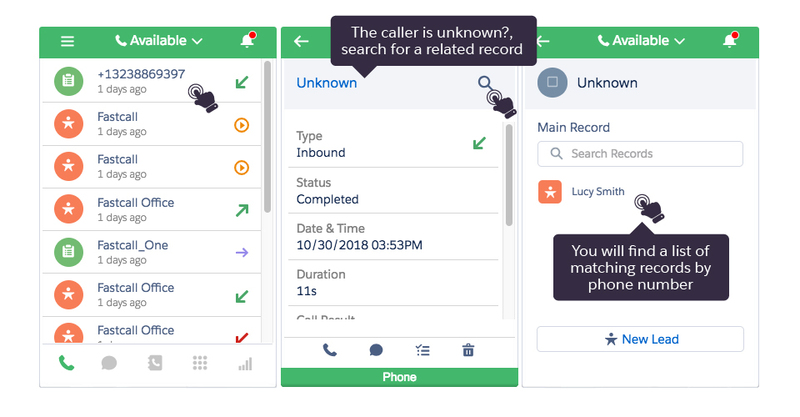 Fastcall inbound calls are logged with the caller ID, the status (answered or missed), and a lookup to the dialed phone and/or IVR user. We report the user who answered the call on the Salesforce “Assigned To” field. Fastcall inbound call routing also gives four custom objects in our package: calls, connections, connection attempts, and voicemail. While a standard call has one connection, a transferred call can have multiple connections. For inbound calls routing through the IVR and transferred using our ACD, there can be many attempts. Our data model and custom objects will report this. For basic inbound calls, the Salesforce Task may be sufficient. Fastcall will give more detailed inbound call information on our custom objects. It is a new functionality in which you can modify the ringtone of your numbers, by selecting the ringtone of the country you want.